Gluten Free & Allergy Friendly: Lunch Made Easy: Gluten Free, Peanut Free, Tree Nut Free, & More! 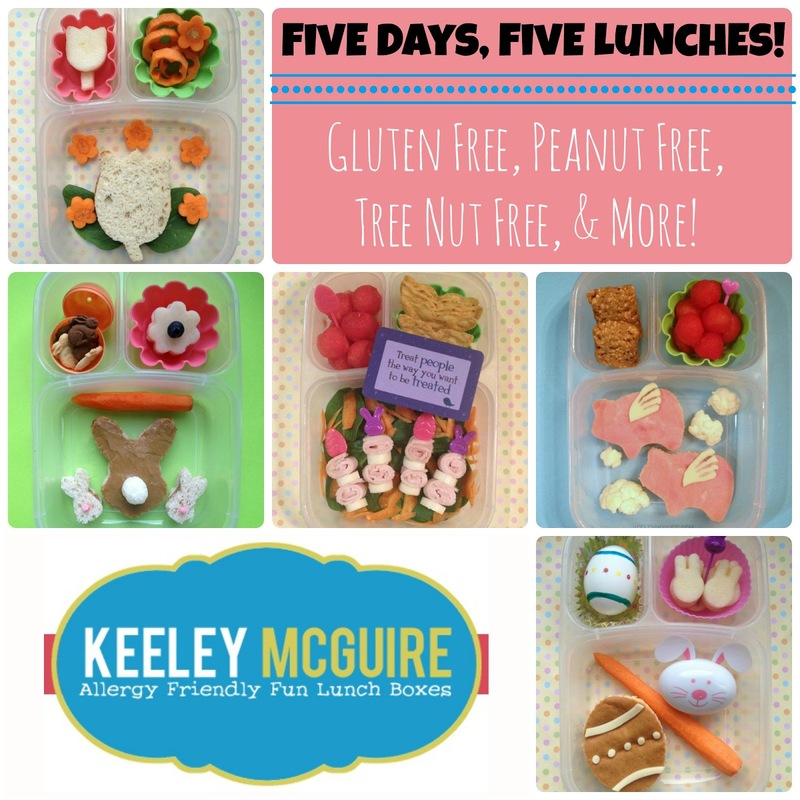 Lunch Made Easy: Gluten Free, Peanut Free, Tree Nut Free, & More! Five Day, Five School Lunches! On Monday we jumped right into the Easter themed fun! Little Miss has a SunButter & Jelly sandwich on an Ener-G brand white rice bun. These buns are free from gluten, wheat, casein, dairy, egg, soy, & nuts. 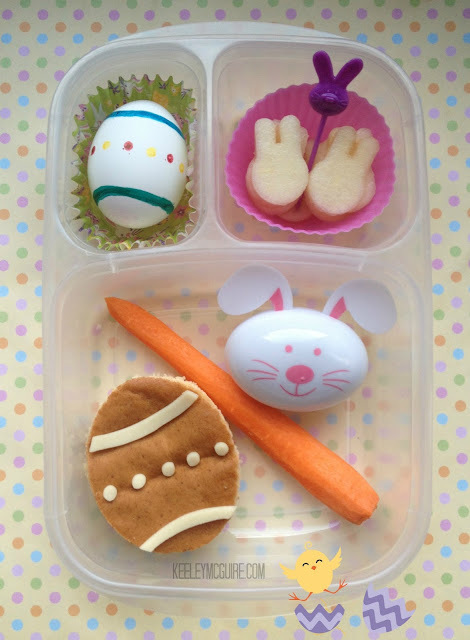 The details of her Easter Egg sandwich are made from provalone cheese. Sub for non-dairy rice or soy cheese to keep this sammie dairy free. 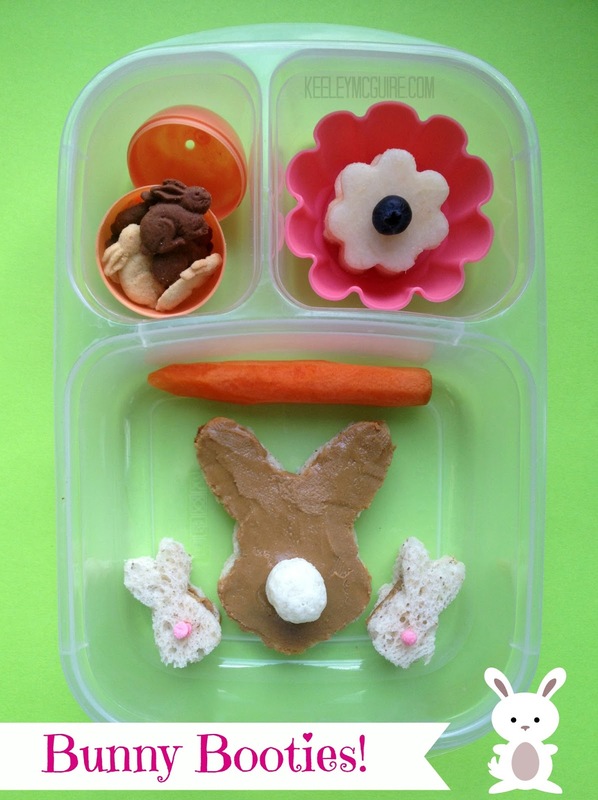 Beside it she has a carrot and raisins are tucked inside the bunny plastic egg. Top left is a hard boiled egg decorated with food safe markers. Top right are fresh cut bunny shaped pears. On Tuesday we had a giggle! Little Miss wanted bacon. So, I gave her some... kind of. ;) Little Miss has two open face ham sandwiches on Udi's gluten, nut, soy & dairy free whole grain bread. Surrounding her flying pigs are cauliflower clouds. Top left is an Enjoy Life Top 8 Free Very Berry Crunch bar. Top right are watermelon balls. 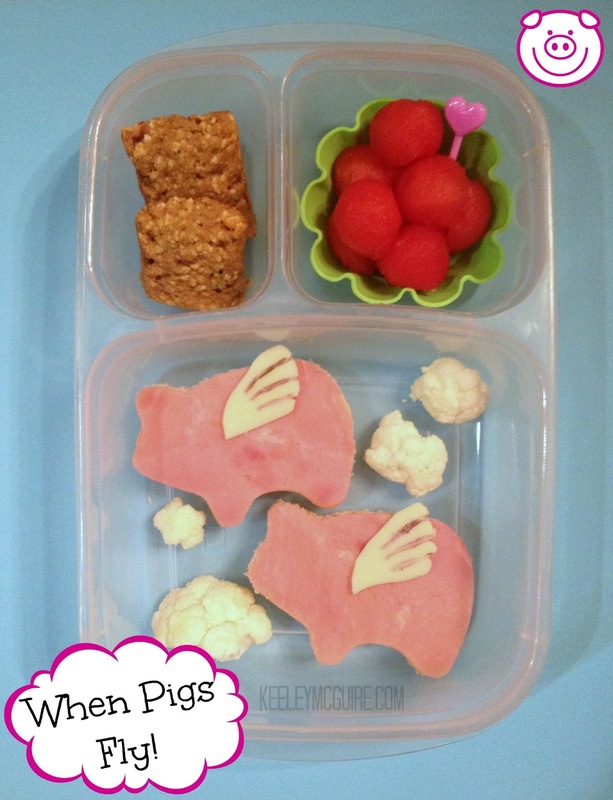 Sub the piggies wings, which are made from provalone cheese, for non-dairy rice or soy cheese to keep this entire lunch dairy free. We had lots of lunch time giggles this week ~ Wednesday we made Bunny Booty sandwiches. This clever idea came from Bentoriffic! Little Miss has SunButter sanwiches on Udi's gluten, nut, dairy, & soy free bread. The baby bunny's tails are made from marshmallow and the larger one is a gluten free Utz brand white cheddar cheese puff. Top left are Annie's Homegrown gluten & nut free Cocoa & Vanilla Bunny Cookies. Top right are flower cut pears slices with a blueberry center. Thursday packed a colorful punch with a spinach salad, topped with freshly grated carrot. We also included Easter themed picks of turkey roll-ups and cheese bites. Sub or omit the cheese to keep this entire lunch dairy free. She also has watermelon balls and non-gmo gluten free corn tortilla chips. I love including Lunchbox Love Notes as a special treat with a special message to brighten her day! Friday was flowery fun! 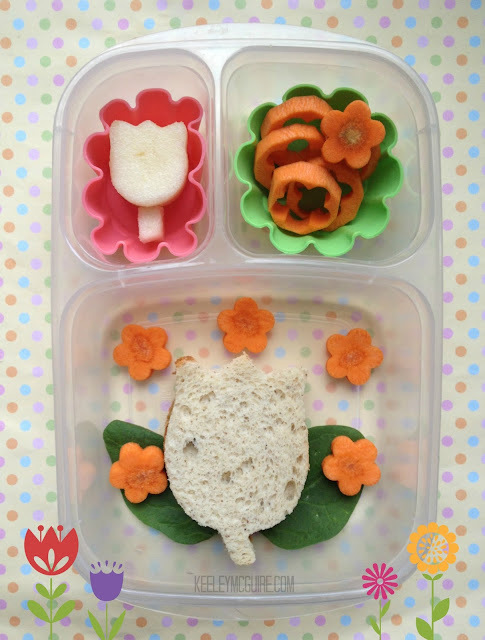 Little Miss has a tulip shaped SunButter & jelly sandwich Udi's gluten, nut, soy, & dairy free whole grain bread. Surrounding it are flower cut carrots. The outside bits are in the upper right (we don't waste!). She also has (her favorite) pears, cut into tulip shapes to match her sandwich. 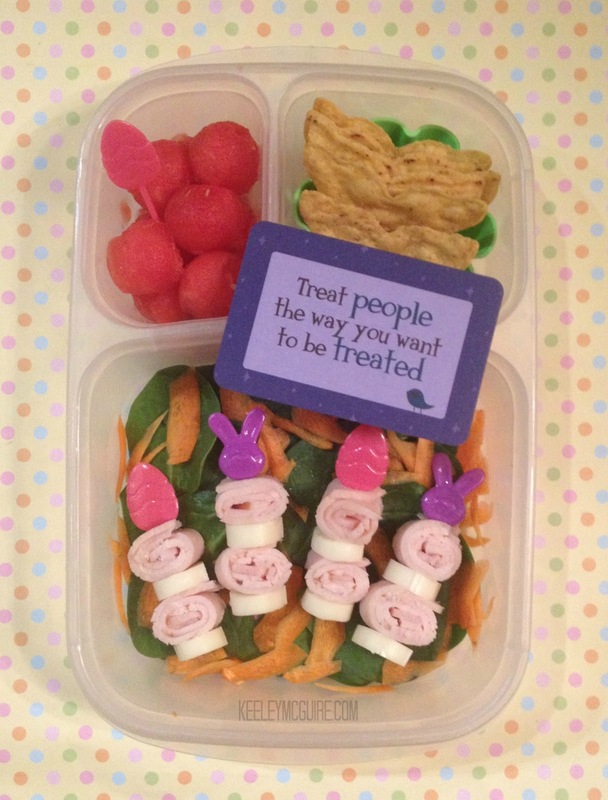 All our lunches this week are packed in EasyLunchboxes containers. If I delgated you to make me lunch for a week? Would you? Could you? How fun you lunches are. will you adopt me? I love these ideas... My grandson is allergic to Milk, Peanuts and Eggs. I'm always looking for new ideas for feeding him.